Kade Matson, 13, of San Clemente is on a tear this season, continuing his 2015 success into the new year with no signs of slowing down. We last caught up with him in October 2015, following back-to-back wins in the National Scholastic Surfing Association Southwest Open Conference Juniors division, along with a win in Men’s. He continued his Open season campaign by taking yet another win in November in Open Men and is now the No. 1 ranked surfer in both Open divisions. A prolific competitor, Kade is also dominating in the NSSA Southwest Explorer Conference Boys division with a string of four straight victories. He is also the No. 3 ranked surfer in Explorer Juniors. Kade’s success extends to the elite, invitation-only Surfing America Prime series this season as well. Currently ranked No. 1 in Boys U14 and No. 5 in Boys U16, he is proving he has the goods to justify his 2015/2016 hard-earned spot on the USA Juniors Team. His most recent performances in Prime, Jan. 9 and 10 at Steamer Lane in Santa Cruz, proved his prowess on large, tricky surf. With waves in the solid 6- to 8-foot-plus range on Sunday, Kade pulled off the win in Boys U16 and took home a second trophy as the third-place finisher in Boys U14. 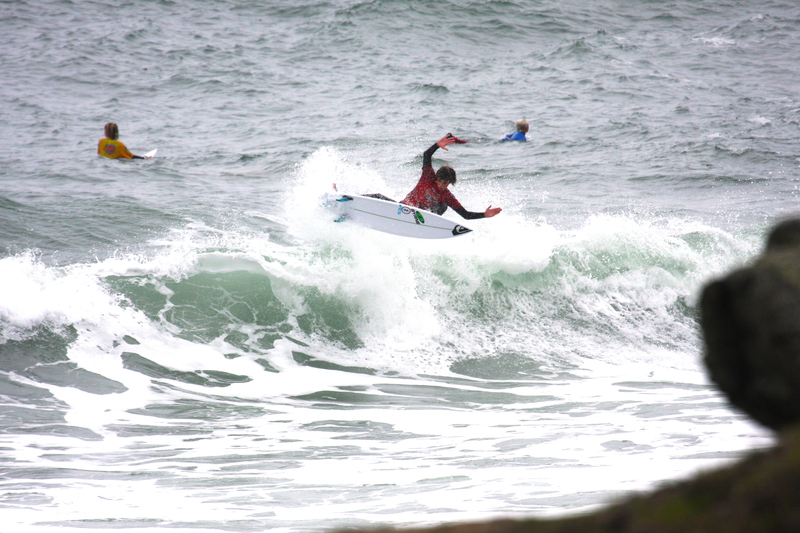 At the pre-contest team training on Friday, Jan. 8, in even more challenging surf—15 feet plus at the middle peak and 10 feet plus at the slot—Kade also had a great showing. Along with working hard to advance his surfing skills, this bright eighth-grader manages to earn good marks in his Connections Academy independent study schooling.